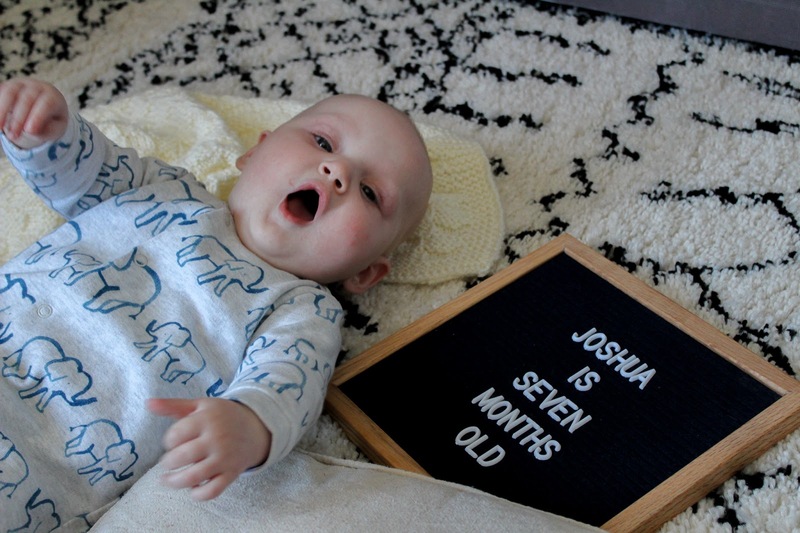 I won't start with the usual, where has the time gone but do know that I'm sat hyperventilating because omg Joshua is seven months old. It's been a funny old month, a lot has happened, a lot has changed and my maternity has finished which is crazy. 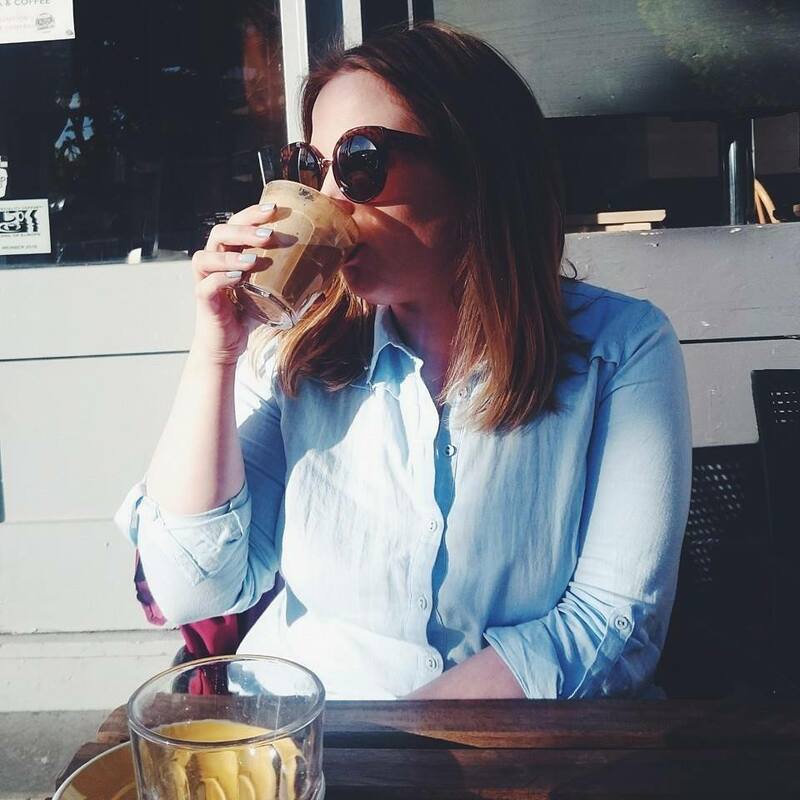 I took maternity very early because I hated where I worked and like a stroke of luck I was made redundant four weeks before it was meant to start so I just handed my notice in and left once my maternity pay was set and authorised. I've had the full 39 weeks paid maternity and now I'm out in the big wide world. It's all very daunting. Anyway, I'm not here to talk about me, I'm updating you guys on Baby Spake. Baby Spake has come on leaps and bounds the last month, he has just changed so much. The big thing is the teeth. We now have six teeth with a seventh on the way. We've gone straight from newborn stage to milk allergy to teething so it's been pretty non stop from the start. The last four weeks, all four of his top front teeth have come in and we have a pesky canine about to break the gum. He's still taking it all in his stride and when he isn't, Nurofen is our best friend. He'll have a full set in no time if he keeps going the rate he is. Weaning is still going well, we're being a bit more adventurous with food but sticking to traditional weaning because it works for us. Joshua is also becoming even more interested in what we're eating and constantly wants it, pitta bread is when he tends to strike and ram a bit in his mouth. We'll be having to share our pitta and houmous sooner than we realised. Sleep is the biggie at the moment. Joshua is pretty good in the sleep department, our only issue at the moment is that he has started rolling on to his stomach in his sleep then waking up and panicking because he can't roll back again which he does absolutely fine during the day. We've tried pillows and towels rolled up either side but he just pushes them out the way so we've decided on the next size Sleepyhead to see if that makes a difference. Lots of people got in touch when I asked for some advice on Instagram so I'm reassured that it will stop eventually, he just needs pushing back at the moment. As I said, during the day he is rolling back and forth all over the place and he's recently found his feet to push up onto his knees to all fours. We don't think it'll be long before he's whizzing around, I'm just not sure we are ready yet. He also loves standing up and his favourite thing is being walked into the kitchen by Arran. They also have a new trust game which made my heart plummet at first. Joshua holds on to the sofa then taps Arran to check he's there before he lets go and falls into him. He loves it and giggles so much every time he falls. We have a daredevil on our hands. He's started babbling and chatting away. He says dada a lot with the occasional mama thrown in if I'm lucky. We also get a hiya after I say it a number of times, it's so cute to see. Whenever he's in his pushchair he sits and babbles away with his tongue lolling around. Raspberries are still very much the best thing to happen and he regularly wakes us up blowing them in the morning. He's such a boy. 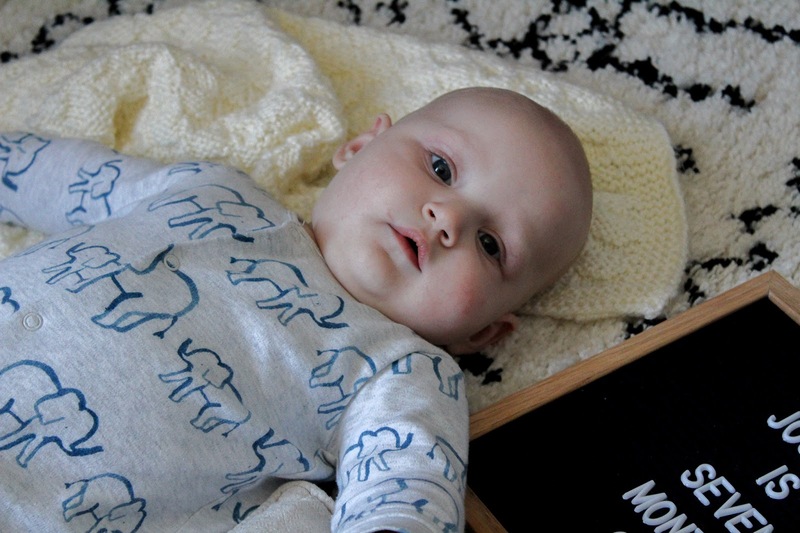 As I said in his last update, we started Daisy Wrigglers but we haven't actually made it to a class yet between him teething badly, being unwell myself and then a bank holiday so our first class is actually class four which is tomorrow. We've already signed up for another term though as we love the Daisy Southampton classes with Ashley. I say we, I enjoy them haha. It's nice to have a cup of tea and a natter some days. Joshua is growing and changing so quickly, that I can't wait to see what the next four weeks bring. I don't think I'm ready for eight months though, we're creeping far to close to one year for my liking. 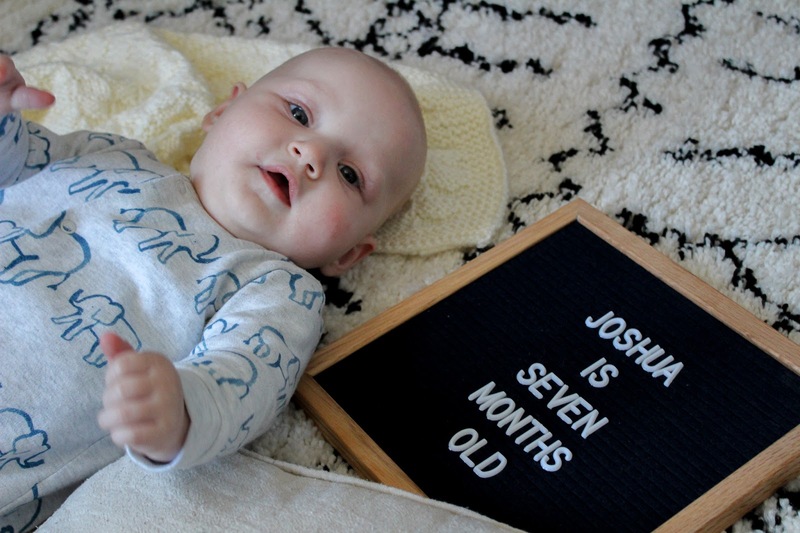 he is not seven months already?! felt like everyone was waiting forever for you to have him and now he's here time is flying! I am loving these updates! It’s amazing to see the month by month changes. Hes coming along so well! 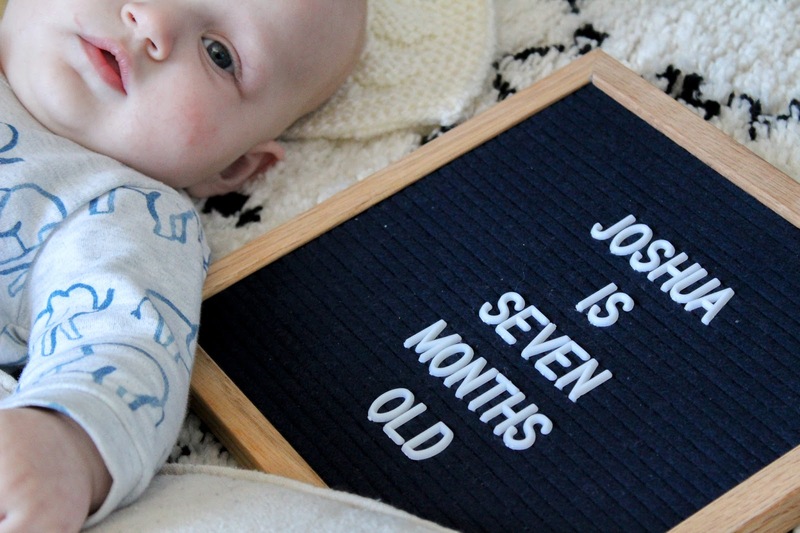 I really can't believe he's 7 months already. It's bloody flown by! Such an adorable little cutie!! He's a bundle of fun!